Tart / Peche 101P – I included the french name from the plastic because it really is a peachy color. I like this one a lot – it’s peachy coral lip color that’s not too strong but pigmented enough that if you know you don’t look good in peaches, you should pass. This was the least sparkly of the group. Cocoa 107P – A strong taupe color. This one looked horrible on me but it would probably look good on someone with olive undertones or darker skin. I tried mixing it with other colors but it just didn’t work on me at all. Reminded me of Burt’s Bees Toffee lipshimmer which also did not work on me whatsoever. I don’t think I have that to compare to currently though so I might be thinking of the Burt’s Bees Cocoa color. Frost 100P – Almost white … just a hint of pink and lots of sparkle. This one seems more moisturizing than the others for some reason. It reminds me a bit of Burt’s Bees lipshimmer in Champagne but even whiter. If you go REALLY light it can be worn by itself barely. It’s really better for making other colors lighter and I will consider it a staple item for this reason. Added to the Tart and I had an almost warm neutral which didn’t make me look dead like most neutrals lipglosses do – super happy with that combination. Sugar 102P – A light bubble gum pink. Again very sparkly. I’m somewhat ambivalent on this one. It’s probably going to work on more skin tones than the rest of the colors. I don’t love it but I don’t hate it. It’s boring and somewhat girly at the same time… I’m not sure. Glad I bought it but wouldn’t buy it again. As for ingredients you’re probably wondering if they are actually natural. 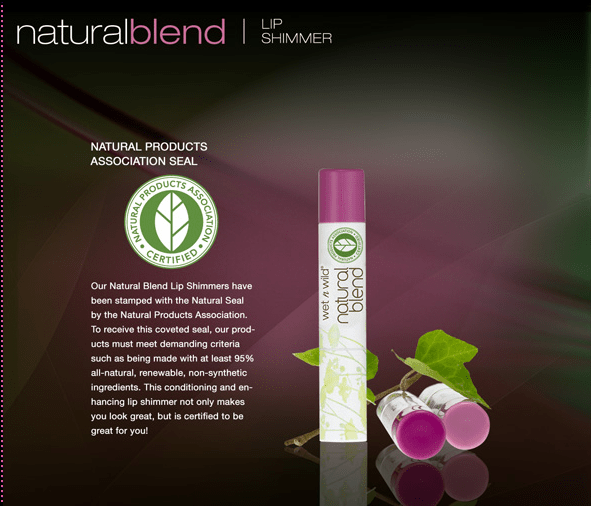 Well they are NOT organic but the best I can tell they ARE much healthier than most lip glosses and lipsticks. I do wonder about possible consistency issues from tube to tube because of the difference in how each felt. I’ll try and post some swatch and lip photos at a later date. Will I buy more? I really want to try the maple and nutmeg colors and for $2 each I’m buying them if I see them. So I’ve been looking for a nice navy lately. I haven’t painted my nails in years for a combination of reasons (chipping and chemicals primarily) but I really wanted to paint them recently. This is Wet n Wild noctural (238?) 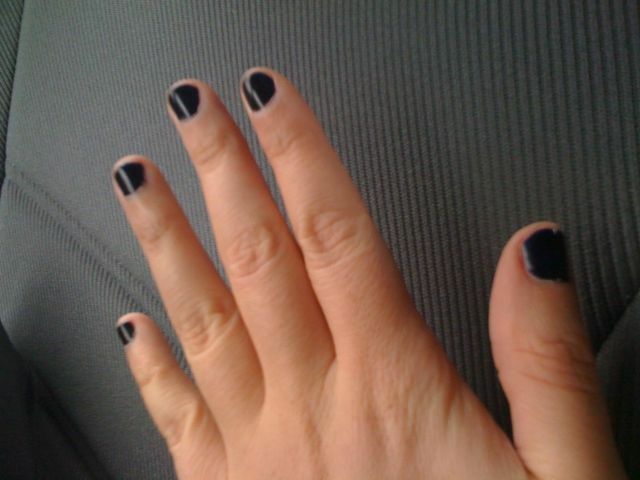 I wish it were a little more obviously navy instead of almost black. Yes?No? Suggestions for a better navy?